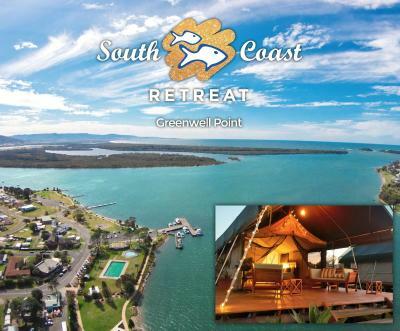 Lock in a great price for South Coast Retreat – rated 8.8 by recent guests! The quality of bread was excellent. I liked the continental breakfast option being provided. Staff were very friendly and helpful. Great location. Fabulous views and very quiet, lovely cottage and well equipped. Friendly staff. The location was great. Also fresh eggs for making breakfast. The kind and caring ladies who make the effort to make an extra special coffee when you need it. Pet friendly and quiet environment though many groups and families were around, nights in particular. Going around to other beaches including Jarvis Bay and other pet friendly beaches was very convenient. Quiet friendly stay great for a romantic getaway or a family holiday .clean according.adatio. and grounds .you dont need to bring much with you loads of things to do .if you dont feel relaxed you havent given south coast retreat a try so come on down and try for your self .we loved and will be back again. Soon .Nice and close for a short break from city stress. 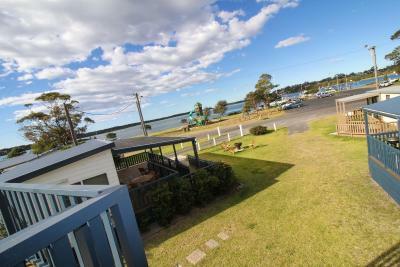 Great location opposite boat ramp, jetty and public swimming pool. Walking distance to cafes. The property was well kept and thought out with central fire pit for guests to sit around and socialize. 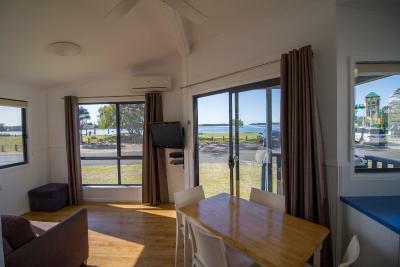 South Coast Retreat This rating is a reflection of how the property compares to the industry standard when it comes to price, facilities and services available. It's based on a self-evaluation by the property. Use this rating to help choose your stay! 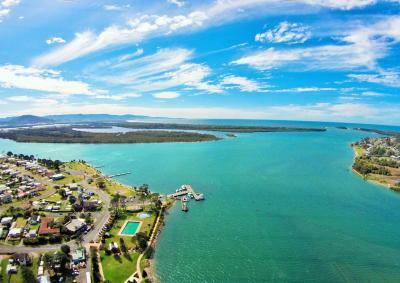 Offering waterfront accommodations, South Coast Retreat is located directly opposite Greenwell Point Beach and Wharf. All accommodations features a private balcony or veranda with a BBQ and outdoor furniture. Free WiFi is available. Jervis Bay National Park is 6.2 mi from the property. Guests can go fishing and kayaking or relax in the outdoor dining and BBQ areas. Guests also have access to a free DVD library and laundry facilities. All accommodations offers a microwave, refrigerator and tea/coffee making facilities. Each has a seating area with a flat-screen TV and DVD player. Some accommodations includes a kitchen, dining and living area. The Pelican Rocks Restaurant & Cafe is located next door and serves a variety of meals including delicious fresh local seafood. 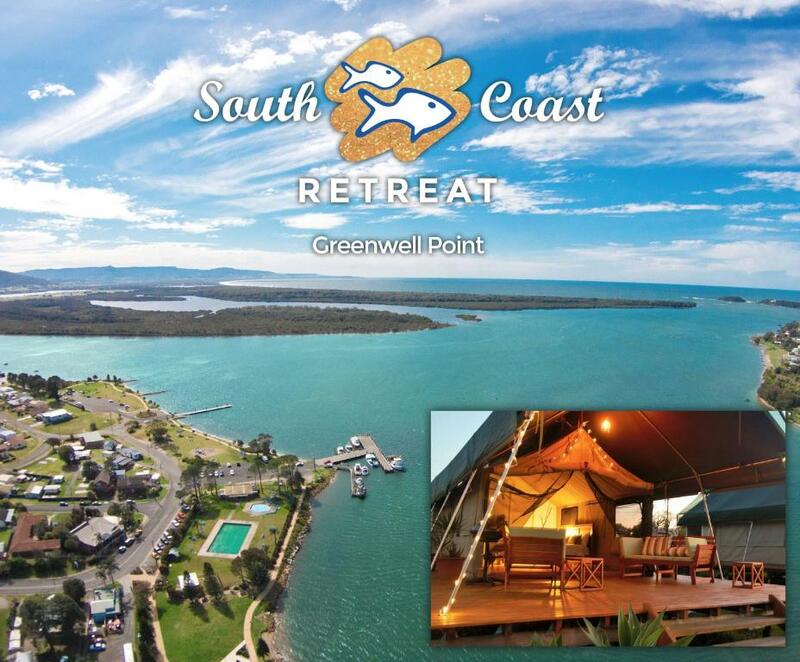 When would you like to stay at South Coast Retreat? This waterfront studio offers a balcony or patio area offering river views and outdoor furniture. There is a kitchenette, a queen bed and an LCD TV. Bed linen is included. This deluxe chalet offers a balcony or patio area with partial river views, outdoor furniture and a BBQ. There is a fully equipped kitchen, a dining area and an open-plan lounge area. Linen included. This waterfront chalet offers a balcony or deck area with river views, outdoor furniture and a BBQ. There is a fully equipped kitchen, a dining area and an open-plan lounge area. Linen is included. This chalet offers partial river views and are elevated with a large deck with outdoor furniture. There is a fully equipped kitchen, a dining area and a sofa. Linen is included. A covered parking area is located beneath the chalet. 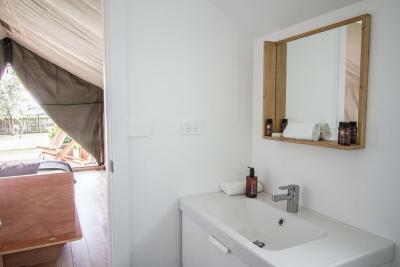 This luxury tent is self-contained with a kitchen and a large modern bathroom with a 2-person shower. It has a large deck with 2 day beds and a BBQ. Inside you will find a beautiful Tasmanian Oak queen-size bed. This large house has been constructed over 3 split levels. 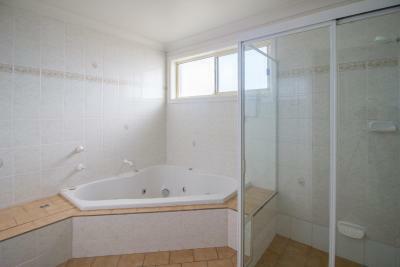 There are 3 bedrooms plus another self-contained bedroom/games room on the ground floor. The living area occupies the upper level and has 360-degree water views to the north and east as well as large front and rear decks. There are 3 bathrooms, including a spa bath. A double garage and an enclosed yard are included. The master bedroom has a private veranda overlooking the water. Please note that pets can be accommodated in this house. House Rules South Coast Retreat takes special requests – add in the next step! South Coast Retreat accepts these cards and reserves the right to temporarily hold an amount prior to arrival. Please note that 4% charge when you pay with an American Express credit card. Please inform South Coast Retreat of your expected arrival time in advance. You can use the Special Requests box when booking, or contact the property directly using the contact details in your confirmation. We will certainly return but hope to book a larger cabin. For a weeks stay the studio was very cosy. View, access to water, quiet location. Loved the location and staff where very friendly and helpful. A suggestion that mosquito coils, bamboo citronella poles, to that effect should be supplied as they were unbearable and had to convey back to the room and could not enjoy the balmy night on the deck. Far too windy during our stay, kept indoors or went sightseeing along the Jervis Bay Coast which is absolutely stunning. It’s probably time for kitchen appliances to be upgraded. As a young child in the 60’s and 70’s I used to go to Greenwell Point and stay with my grandparents, I loved how the foreshore has changed, but how the South Coast Resort is right there next to everything, pool, jetty’s etc and the resort is not very big, just big enough, I loved it, I live here in SA and will be back, that’s for sure, thank you to the staff. Needs a bit of maintenance eg cracked floor tiles mould in shower. Power blackouts during storms a bit inconvenient. 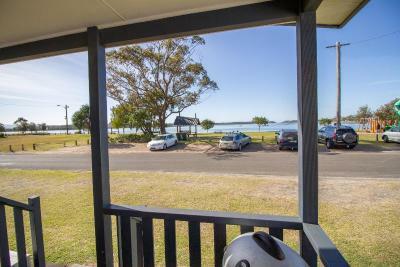 Close to waterfront, cafes and walkways. Kim was very helpful. Eggs were appreciated. Roomy cabin, well appointed kitchen and cooking facilities. The glamping tent was amazing! Was also great to have my pooch there! Everything was perfect for a quick getaway. The owners were so friendly! The safari tent was great. 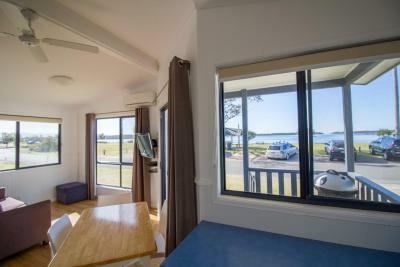 Big verandah for relaxing during the day, awesome lighting, comfy bed, efficient kitchen. 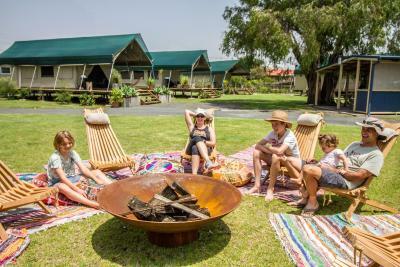 We also loved the communal fire pit at night and fresh eggs and lemons every morning!